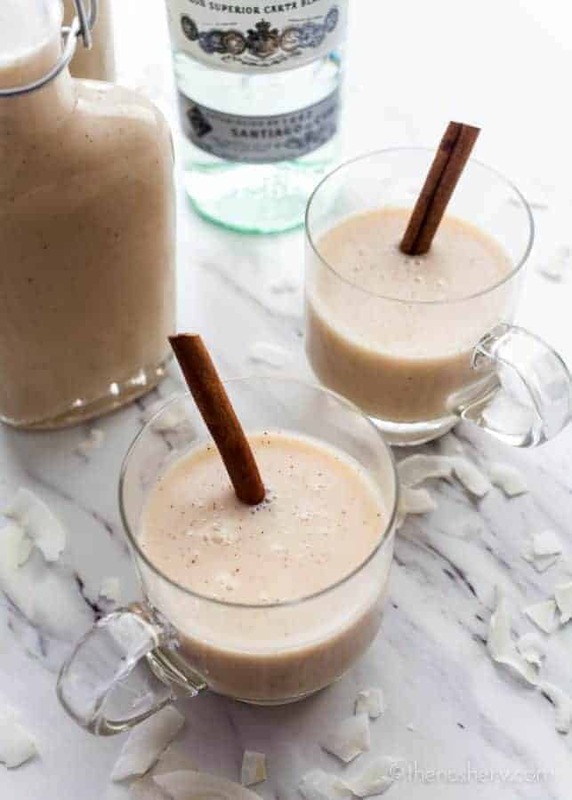 Coquito | Christmas isn’t Christmas without a glass of cold coquito (co-kee-to). If you don’t know what’s coquito my heart hurts for you because it’s the best thing EVER! I like to call it eggnog’s better tasting sassy cousin. Even though it’s nothing like eggnog. I make bottles of this every year and give away as gifts to friends and family. Bring a bottle of coquito to any holiday party and I am positive you will be invited back the next year. 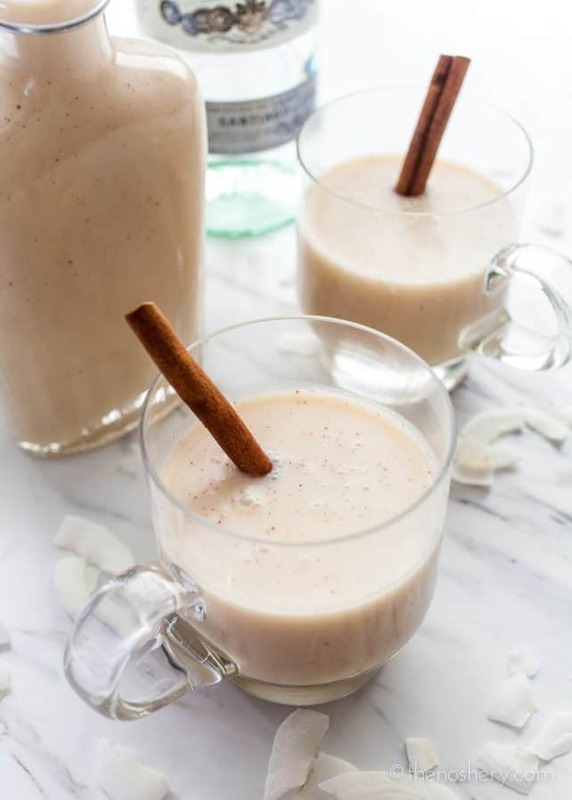 Like many traditional foods or drinks that coquito can trigger some passionate debate. The biggest debate regarding coquito is with or without egg yolk. Now I’m not knocking eggnog. In fact, my friend Rebecca has a killer eggnog recipe. But eggnog and coquito are not the same thing. Abuela once told me that the addition of egg yolk was the influence of the classic American Christmas drink eggnog. How true that is I can’t say but I continue to stand firm in the no egg yolk camp. If your abuela made it with egg yolk go for it. Regardless of the eternal egg yolk debate the main ingredients of coquito, are coconut milk, coconut cream, Puerto Rican rum, and sweetened condensed milk. 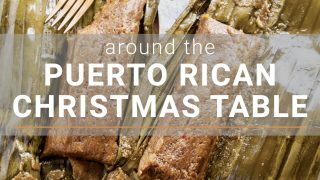 The result is a creamy coconut rum drink that is essential to any Puerto Rican Christmas celebration. Coquito literally translates as “little coconut”. It’s best enjoyed super cold. I always suggest starting with a small glass because it’s very rich. But, it’s hard to have just one glass. I can say with 110% confidence that you will never touch eggnog again after tasting coquito. Ok, maybe 99% confidence. But come on! Who doesn’t want a little coconut in a glass? In the recipe, I suggest 1 1/2 cups of white rum. If that sounds like too much start with 1 cup and add more to taste. I like to add just enough rum that it’s prickly on the back of your throat and warms you on the inside. It will be one of the few drinks you’ll have that is cold that warms you up. Just be careful because the flavor of the rum gets stronger the longer the drink “marinades”. How Long Does Coquito Last? Another reason I choose to make my coquito without egg yolks is that it extends its shelf life. 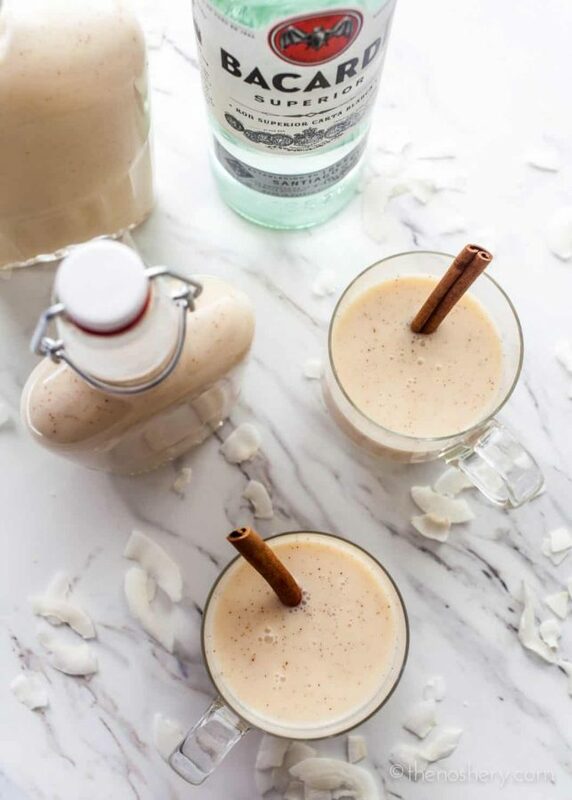 Coquito should last in your refrigerator for 4 – 6 months. If you your coquito has a little fat cap at that top that is completely normal. That is just the coconut milk fat separating which is normal. 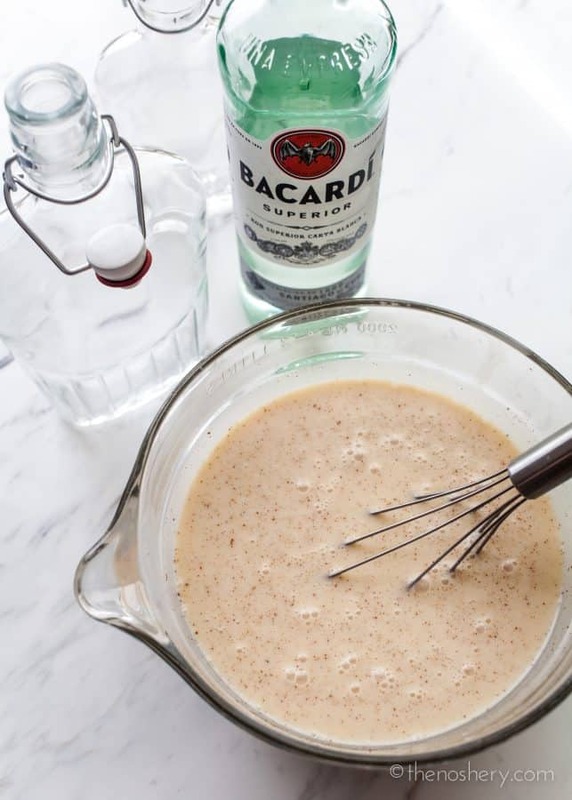 Give your coquito a poke and a good shake and you are good to go. Again if you are making a version that includes eggs or other ingredients it might not last as long so please do not apply this time frame to other recipes. This recipe calls for cream of coconut like Coco Lopez. This is different from coconut milk and coconut cream. Coquito (without egg) will last in an airtight container refrigerated for 4-6 months. If the some of the coconut fat solidifies let it sit on the counter for 10 minutes and give it a good shake before serving. Traditional coquito is made with Puerto Rican Rum like Don Q. 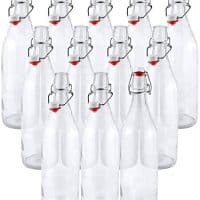 These swing-top bottles are great for gifting coquito. Regardless of how you or your family make coquito, I will never turn a glass down. It’s one of those things that to me is synonymous with the holidays. Coquito means Christmas, parranda, family, and just good times. 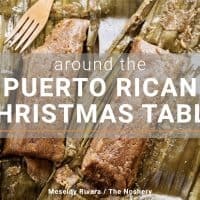 If you are looking for more holiday Puerto Rican treats try Arroz con Gandules, Roasted Pernil, or Pasteles de Masa. But you have been warned all of these are incredibly addictive. Are you in search of even more Puerto Rican flavors? Visit my entire collection of Puerto Rican recipes. Christmas means it's time for coquito! Coquito is a rich creamy coconut and rum drink that is served in Puerto Rico for Christmas. 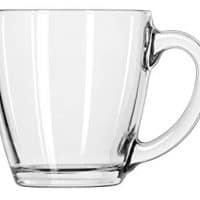 Serve cold in a small glass. Garnish with cinnamon stick. I brought this to a gathering of friends. I used a little less rum (2/3 or 3/4 cup was all I had left in the bottle) I found it almost too sweet but it was a real hit and I may make it next year for gifts. Delicious! I got approval from my Puerto Rican friends. Finished a batch in a night! Aside from the issue with weird chunks ruining the texture that I’ve aired in another comment, this really does taste good and is ridiculously easy to put together compared to the eggnog I usually make. The only problem that everyone I’ve served this to (who are no slouches in the drink department) had is that it’s *way* too rummy. I know this is mentioned in the preamble to the recipe but I want to stress harder how rummy it is and how people may want to dial it back, even by just half a cup, from the start, before going with the full 1 1/2 cups of rum. Omg! Muchisima gracias por la receta, I just made your Coquito and it is amazing. I can’t wait to share it with everyone I know. There should be no chunkiness. None of the products should be chunky. You should be using “cream of coconut” not coconut cream. Those are two different products. Once whisked or blended it should be smooth. Ok, I just mixed up a batch & my coconut cream coagulated at the top & it kind of chunky. Did I mixed it too much? Not enough? Do I strain that off? Did I miss something? You should be using “cream of coconut” not coconut cream these are two different products and have different textures. The folks saying “coconut cream” may not be saying what they mean correctly/providing enough information. I used Coco Lopez Cream of Coconut and my batch also has a chunkiness issue that’s making it hard to enjoy. The whole batch has impossible to see rice sized Cream of Coconut pebbles through it’s otherwise smooth texture. No “fat cap” has formed after refriating over night, but the pebbles that were there the night before have stayed strong. I’ve thought about straining it but between the pain of doing all that and the fact that most of the batch is already gone, there’s really no point in attempting it anymore. The pebbles are a result of the “fat cap” that formed on the top of the Coco Lopez can, which made up 90% of the can I used, that didn’t break up while mixing. So what I think they, and myself, are trying to ask is how to make solidified Cream of Coconut liquid again, before adding to the rest of the recipe, without destroying the product or the recipe. And since I can feel the question sitting in the air: the Cream of Coconut I used was never stored in a cold place, only dry room temp cabinets, before use. I just made it and it’s kinda frothy at the top or I think the cream of coconut didn’t mix. What can I do? You can either blend it or just give it some time for the froth to settle. I’ve just made it and it’s delicious but I need it for Christmas Eve and it’s December 21 – Have I made it too early? Will it be too strong or will it be okay? If so, what can I do to lighten the strength? You should be fine. It may be a little more “seasoned” but it will still be good. If you are concerned you can give it a little taste and adjust the strength by adding some coconut milk a little at a time. Last minute, I don’t have coconut milk. Super market is already closed. For a non-alcoholic can I substitute with whole milk or stilk milk instead? No, coquito means “little coconut” it is a coconut drink. Otherwise, it milk drink with rum. Also, this recipe calls for “cream of coconut” not coconut milk. They are two different things. Cream of coconut can normally be found in the drink mix aisle. I added a pint of heavy cream and an additional can of evaporated milk. Creamier and a little less sweet. Enjoying some right now with a Moravian spice cookie. I hope I have some left for Christmas. At the recipe states (it’s in the top left-hand corner of the recipe card) it makes 6 servings or 53 ounces. On the coconut cream.. couldn’t find the coco Lopez. Two brands I found, one was a heavy cream but consistency of coconut milk, the other was a thick paste. Which one would be better? Coco Lopez has a consistency that is similar to sweetened condensed milk. The bottle or can will say “cream of coconut”. My guess is that’s it’s the second one. Ok – admittedly I didn’t keep scrolling to read all the comments, so maybe it was addressed…But, I thought there was supposed to be Coconut Milk? Have you just left that off the ingredient list? Or, are you using evaporated milk instead of coconut milk? Not sure if this was asked but can you use spiced rums? Wondering if it would take away from the experience. Could you use dark rum instead of light rum? Do you think making it with a coconut flavored rum instead of traditional white rum would be too much coconut flavor? Or take away from the natural coconut flavor? I haven’t tried it with coconut rum. It is already a very coconutty drink. It really up to your personal tastes. Would a non alcoholic version of a coquito still be good? My mom isn’t much of a drinker and my brothers are underaged, so I don’t want to make one alcoholic coquito and then a virgin. Everything about a coquito sounds delicious, so I kind of want to make them for Christmas. Yes, that would work just fine. If it’s too thick you may want to add some coconut milk in place of the rum. Could i use coconut rum instead of regular rum or would that be too much coconut flavor???? Coconut water works great in place of the rum? I have never used coconut water in the recipe so I can’t speak to that. If you are trying to make a non-alcoholic version I would maybe use coconut milk. This was delicious. I think it gets better as it ages/cools in the fridge. I liked it more the second day. Whatever you do, don’t run this through VeryWell’s nutrition calculator, because your jaw will drop at the calories, fat, and sugar in this recipe per serving. This is much richer, fattier, and with more sugar than say, Horizon eggnog. OK, it’s very tasty but to say it’s “nothing at all like egg nog” is just sophistry. C’mon, It’s a LOT like egg nog. And while it may be a worthy alternative to the nog, it’s definitely not going to make me spit on any future attempts to indulge in the latter. Get real, folks. When I asked my family which they preferred, it was basically a shrug and a lean back to what they are used to. -10 points for unwarranted hype. Will I make it again? Yes. Will I renounce regular egg nog? Nope. A practical note that may be of interest: I’ve never liked the “cooked” taste of evaporated milk. Initially, this dampened my enjoyment of coquito. But I found that after a couple of days in the fridge, that taste had gone away and what remained was terrific. Made it with dark rum. It was delish. I’ve made the original with real coconuts, eggs, etc. Abuelas’s recipe. This is different, but very good. How much does this receipe make? Mines in the fridge right now. Didn’t have the coconut milk or condensed milk, just doubled the rum! Can’t wait to consume. Will comment again in 2 hrs. Coquito is coconut, you missed the main ingredient.? Whipping up a batch right now,purely a test run.Tomorrow I go Live! Apparently John never came back “in 2 hours” so…. Guess doubling the rum worked for him!????? I plan on making this for xmas this year and I want to know if i can use jamaican white rum instead of bacardi or Palo viejo. Traditionally made with Don Q but you can use any quality rum. Sounds delicious but could I make a non-alcoholic version? Water with rum extract maybe? I have never tried it but it’s worth a try. ? If giving as a gift at a party with no fridge will it go bad for sitting out of a fridge for a few hours ?? It should be ok but to safe just put it in a bucket of ice. It’s best served chilled anyways. Just made our first batch of Coquito can’t wait until tomorrow Christmas Eve to try!!! Yummy! This is pretty much the recipe I use. The only main difference is I boil cinnamon sticks in water. And add some of it to my batch so it’s not so thick. I’ve made other variations, such as using coconut flavored rum, or coconut milk if I mistakenly pick it up instead of the cream, and sometimes even added coconut flakes. I’ve never added egg yolks to mine. Just not our thing. But you really can’t go wrong with it. If it tastes good to you that’s all that really matters. Salud! Thanks for sharing, making this on Saturday for the first time and if all goes well will be making more to share as Xmas gift…Thank you and happy Holidays!!!! This brings back fond memories of my honeymoon in San Juan between Christmas and New Years. Our hotel had free cups of this all day and night! Made this last night. It’s pretty awesome. Will be making again. Thanks. and the sweetened condensed milk? No eggs in mine!!!! Allergy to the whole egg!!!!! Plus with the eggs it doesn’t last as long it goes bad!!!!! Yuk!!!! I use coconut milk instead. I just found sweetened condensed coconut milk and evaporated coconut milk at a regular store! I’m in the same boat as you. It may be on Amazon, too. It was next to the regular canned milks in the baking aisle. 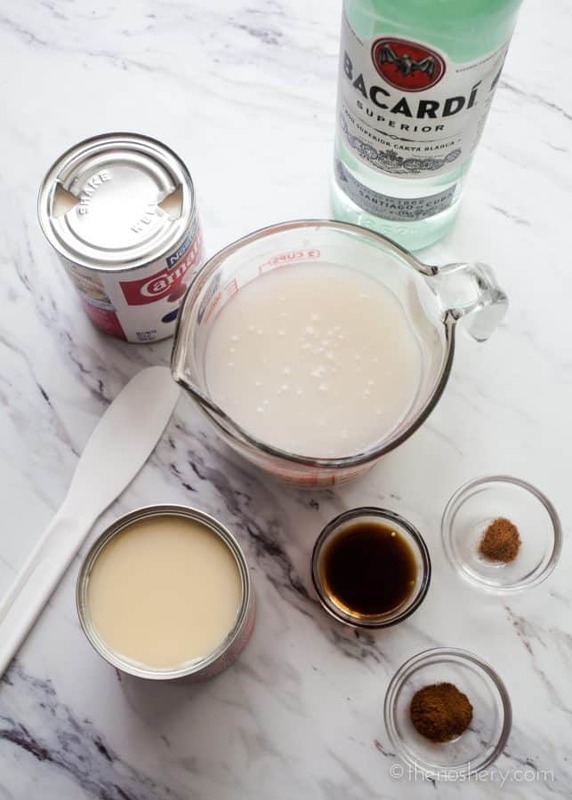 You can make sweetened condensed milk from coconut milk. Search for video on line. (How to make dairy free condensed milk on Youtube). You can Lactaid for evaporated milk. Add pieces of coconut flakes to drink. I add cinnamon sugar on top. They have coconut milk versions of the evaporated and condensed milk, at places like Sprouts, etc. Totally planning to make this dairy-free! I use coconut evaporated milk and coconut condensed milk, and prefer the dairy free version to my dairy version. I have never used coconut rum. It’s already pretty coconutty but I if you want to add more I dont see why not. I’m confused, it’s says cooking time is an hour but the directions say to put all of the ingredients in a blender, mix and refrigerate? Because it needs to refrigerate for at least 1 hour. I know it’s not “cooking” but it needs to chill and let the flavors develop. It will keep well in the fridge for weeks. Make sure bottles to store it are very clean and dry. Some people add nutella or pistachio flavor for a twist. So you don’t have to cook it on the stove?? Just wondering because people at my job say to put it on a stove. I really want to make sum. I just want to do it right. My daughter and I are in your camp too! ?? Just made this for her, LOVES it and kept commenting how she likes that there’s no egg (you truly don’t miss it. Thank you so much for the recipe! (We used coconut run but we’re coconut crazy lol)?? I use gold Bacardi 151 proof. My coquito keep u warm for sure!!!!! No coconut rum seem to taste artificial coconut YUK!!!!! I have been looking go this for so long but the original recipe called for dome thing like 8 eggs but No cooking just mixing. Help. My recipe has never had eggs in it. Also, 8 eggs is a lot of egg. That sounds more like a flan or a really big batch of coquito. I wrote the recipe to do Coquito, for the holidays ,this is the first time doing coquito.I hope it come out good. Thank you for the recipe. My Husband is from Puerto Rico and he follow your instructions and I’m sold. It’s very easy to make and very delish. From last night until Christmas we will have Coquito every night. Haha. Merry Christmas to you all. I don’t see why not. It’s already a very thick drink though. Oh, my gosh, I made your coquitos for Christmas Eve and they were a huge hit! I followed this recipe but could not find cream of coconut…Instead I used coconut milk and culinary coconut milk which was very thick almost a paste….It floored me how delicious this is!!! Thank you! Can you use spice rum? Spice rum will definitely give coquito a slightly different taste. It is really up to you! I prefer the usual way, the only thing I add is more rum! Wow! Is there a substitute for coconut cream for those who may no like coconut? Could you please send me the recipe for rice pudding? If giving as a gift.. how long will this last in the fridge? Should you skim the hard coconut oil off the top of the cream de coconut or mix with other ingredients in blender? I think you maybe thinking of canned coconut milk. You want to use cream of coconut (like Coco Lopez), not coconut milk. You typically find it in the cocktail mix aisle at the super market. I always use coconut milk, fresh or canned, in addition to the evaporated and condensed milk and the Coco Lopez. If using canned, I use Thai coconut milk because it’s thick and very flavorful. If you don’t add coconut milk it lacks that coconut flavor that it should have. I don’t use white rum because the gold rum is smoother. 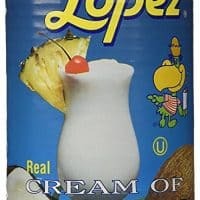 I always warm the can of Coco Lopez Cream of Coconut before using it so that it mixes better. Just put the can in warm water before opening. Then shake before opening the can. I love your blog, always bring me happiness. Coquito yummy.